Seeking My Life: Whoa! That thing is HUGE! Whoa! That thing is HUGE! OK, I am trying really hard to get my work done, when I hear the title statement outside my window from my 7-year old. I can tell he is near the rosebush, and I don't want to blow my cover by opening the shades, so I go around through the front door. 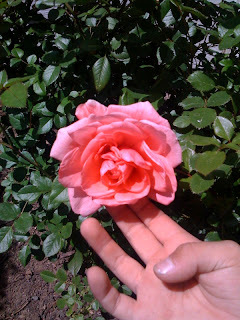 He is pointing at the first rose in the garden this year, which budded last week. Now in its full flower, it is rather impressive looking. Amazing to think this was one of those disposable supermarket rose plants just 3 years ago. A good friend gave it to me when I was sick. I planted it outside when I got tired of watering it, to see if it could survive on its own. It is now a respectable looking 3' high rosebush. At the suggestion we cut the blossom to enjoy in the house, Barley looks shocked, and says, "Noo, that's its first one! We can't take that!" My demanding grouch can be so sensitive sometimes. Checking out the other plants in the front, he immediately noticed the coffee grounds around the blueberry bushes, and said authoritatively, "I see you put down some new dirt, mom. Good work." So, now he just needs a cowboy hat and some wheat stalk to chew on while hooking his thumbs in his jeans.